This Amish Made Homestead Garden Shed is so cozy and cute you will have a hard time calling it a storage shed! With a simple, traditional design, the Homestead Shed is an excellent choice for nearly any backyard! Why settle for cheaply made sheds from the local hardware store? This easy DIY shed kit is handcrafted by the Amish. By purchasing an Amish built shed, you can rest easy knowing that it'll last for years and years. The expert Amish craftsmen that build this Homestead Shed Kit don't cut any corners when it comes to crafting high quality sheds. This shed kit is delivered as a panelized kit, which means it comes with the walls already assembled in sections. By using a specialty saw, each wall stud is cut with a one-of-a-kind notch. This woodworker then installs a 2x3" strongback nailer, which creates a straighter and stronger wall. Additionally, this increases the nailing surface for the siding panels. Top it off with the double top plates, which create stiff walls and very strong corners where the plates overlap. This beauty comes standard with a 30" x 36" double window, which lets in all that summer sunshine - who can't pass up that natural light? The wide, double doors, allow easy access for storing lawn equipment, bikes and other bulky gear. Add optional flower boxes, transom windows and a delightful weathervane for even more style that'll get everyone in the neighborhood talking! This Amish built shed can even be further customized by choosing the location of the doors and windows. It comes standard with them placed as shown in the photo, but can be changed at no charge. We get it - buying a shed online is kind of intimidating. There is so much to think about and make sure you get right. Don't worry, we have knowledgeable and friendly Amish furniture specialists that can help you create the perfect DIY shed kit - whether it's simply for storage, or for the backyard garden. We've got you covered - give us a call at 1-866-272-6773! 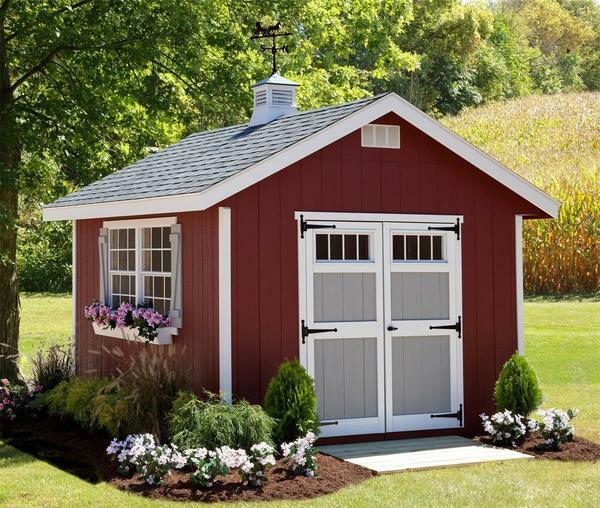 Inside Peak Height: 8' 6"
Inside Peak Height: 9' 2"
Inside Peak Height: 9' 10"
Pictured is an 8x8 Homestead Shed with Transom Windows for Double Doors, 16" Cupola, Horse and Buggy Weathervane, and 2 Flowerboxes. *The Amish Made Homestead Storage Shed Kit ships via freight and may require an appointment for delivery. Here is a picture of the she shed I made for my wife with your product. Thank you, we are very pleased with it.